Valentine’s Day is no different, and we love to celebrate it as a family. I made a cute bunting out of fourteen hearts, and placed a Valentine activity on the back of each one. Beginning February 1st, we do a Valentine activity each day! My motto is always simplicity, so most of the things we do are easy crafts or projects we can do in an hour–or more if we want to! 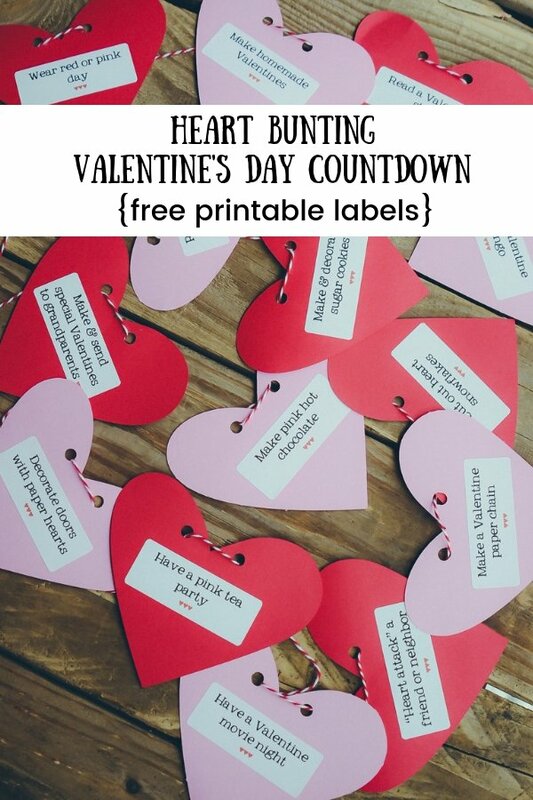 Another fun & easy way to do a countdown is by making a paper chain: Cut out fourteen strips of red & pink paper, write a Valentine activity on each one, then use a little glue or double stick tape to loop them together and make a chain. Hang it up where you can see it, and then take one off each day! ♥ Valentine Bingo: This is fun to play with the little ones at home during the day, and also when the school kids get home. It’s a great Sunday afternoon activity. I like to use Valentine M&M’s as the markers! To download a fun Valentine Bingo game, click HERE. Print onto white cardstock! ♥ “Heart attack” friends/neighbors: Cut out hearts of all sizes and quietly put them on someone’s garage door, front door, sidewalk, etc. Leave a plate of treats, then ring the bell and run! ♥ Make & decorate Valentine cookies: You can make your own cookies from scratch, or use a sugar cookie mix. My favorite mix is by Betty Crocker—I always get asked for the recipe! My favorite gluten free sugar cookie mix is by Cherrybrook Kitchen. I make red, pink, and white frosting, and then let them go to town with sprinkles and decorating! ♥ Make heart snowflakes: Cut hearts out of red, pink and white cardstock in different sizes and make snowflakes. 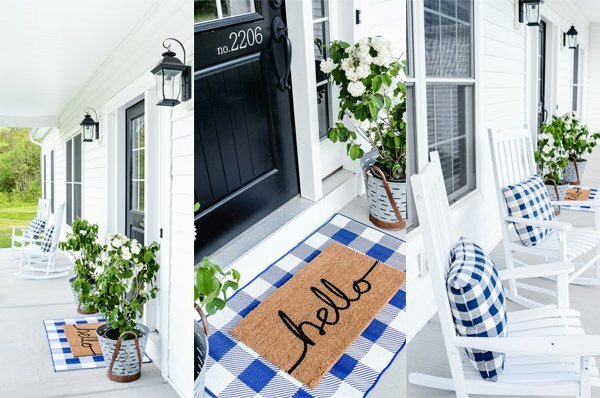 It’s fun to hang them with string or baker’s twine from the mantel, light fixture, doorway, or window. ♥ Read a Valentine story: I head to the library the last week of January and stock up on Valentine’s Day books. I’ll put aside a couple for the countdown, and the others I set out for them to enjoy all the time. ♥ Watch a fun Valentine show: We love family movie nights, and we go with a Valentine theme during our countdown weeks! I’ve included a list of 14 Valentine’s Day movies for families, and our favorites! ♥ Make pink hot chocolate: This is such a favorite with my kids! Our family loves hot chocolate, and making it pink is fun & festive. You can find the recipe on page…. 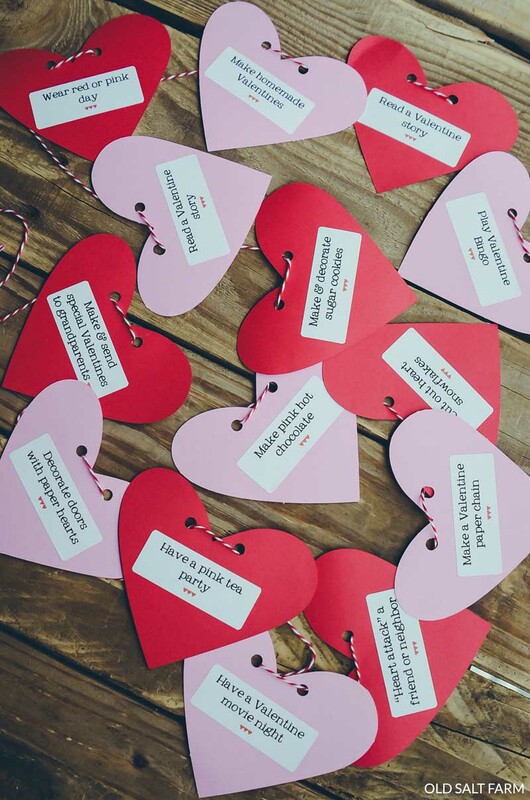 ♥ Make a Valentine chain/red, pink & white cardstock: If you’re not using a chain as the countdown itself, it’s always fun to make them really long and string along windows, doorways, or the mantel. ♥ Cut hearts out of paper and decorate the doors in your house: Smothering doors in pink, red and white hearts just makes the whole house feel the love! ♥ Create Valentines for grandparents and other family: Making homemade Valentines for the people you love is always a fun tradition to have, especially for those that live far away. Set out cardstock, glitter, glue, paper doilies, pipe cleaner and any other embellishments you want, and let the kids go for it! ♥ Have a pink tea party: Pink hot chocolate, sandwiches cut into hearts, some stuffed animals and baby dolls, and you’ve got all the makings of perfectly pink tea party. ♥ Wear red & pink all day: This is so fun, especially for my school-aged kids. They also love it when I do it too! ♥ Cut out 14 hearts out of red, pink, and white cardstock—or whatever colors you like! I made mine about 5 inches in diameter. You can decorate them however you like—add numbers if you want to count down using specific hears. 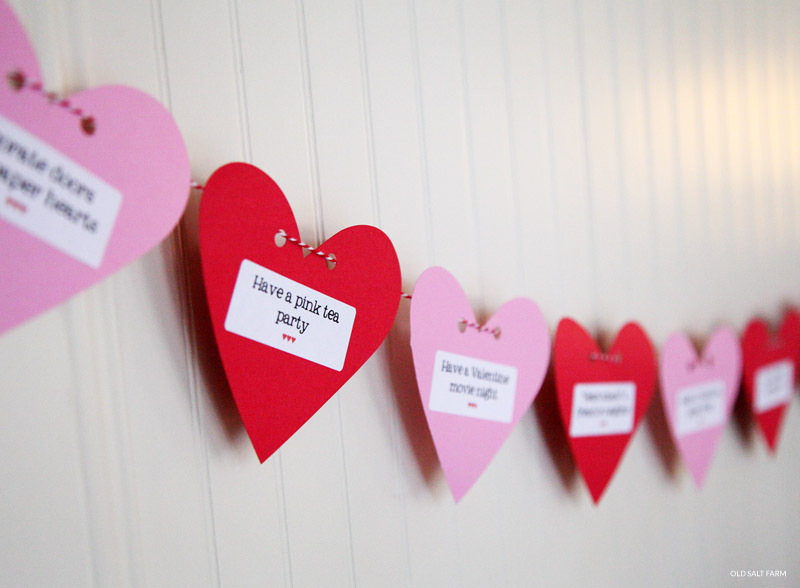 ♥ Write a Valentine activity on the back of each heart. I’m also sharing a printable that includes 14 activities and you can print out on Avery 8160 address labels—just stick them on the back! Enter the following url address into the address bar of your computer, then save and print. ♥ Punch two holes at the top of each heart, then string them on baker’s twine. Another option: A few years ago I painted 14 tiny clothespins (I found them at my local craft/hobby store. ), then used them to clip the hearts onto a long piece of twine, string, or ribbon. ♥ Hang along a mantel or shelf, down a banister, on the front of a table, or across a large window or door! since it has been -20 here, we will be anxiously awaiting the pink hot choc recipe, Kierste!!!!! Bunting is super cute!! Love the hearts on the staircase. Super cute!! So cute, girl! My kids would LOVE this!! The heart bunting is SO CUTE! I would love to make this this year. How did you cut out the hearts in that great design? Was it on the silhouette or something else? Thanks for the information and for sharing this idea. I was wondering if you would share the name and brand of paint that is on your walls throughout your house. I really like it. Thanks!